Students of Promise Are Nevada's Future! Students from across the JAG Nevada network brightened the halls of the Legislature in Carson City on March 20th as they participated in the Third Biennial JAG Day at the Legislature. 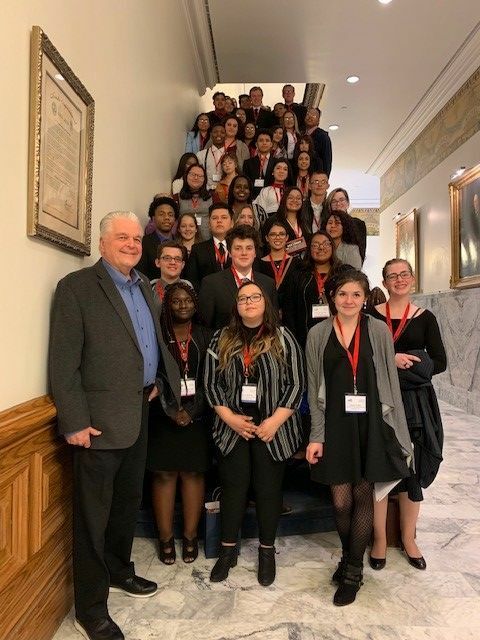 Traveling from as far as West Wendover and Round Mountain and as near as Pioneer High School in Carson City, students spent the day meeting with legislators, touring the Nevada Supreme Court, visiting with Governor Steve Sisolak in order to learn about Nevada's governance. The highlight of the afternoon was a very engaging conversation with Governor Steve Sisolak who listened to student stories and shared his own words of wisdom. "Legislative Day is life changing for students because it broadens their perspective on the world, and helps them to see themselves as leaders for Nevada's future." said Dr. Rene Cantu, Executive Director of JAG Nevada, as the day came to a successful close. JAG salutes the Venetian/Sands Corporation for their sponsorship of the First Annual JAG Prom Competition. Seniors from across the Southern Nevada JAG network competed to win a Dream Prom for their school. 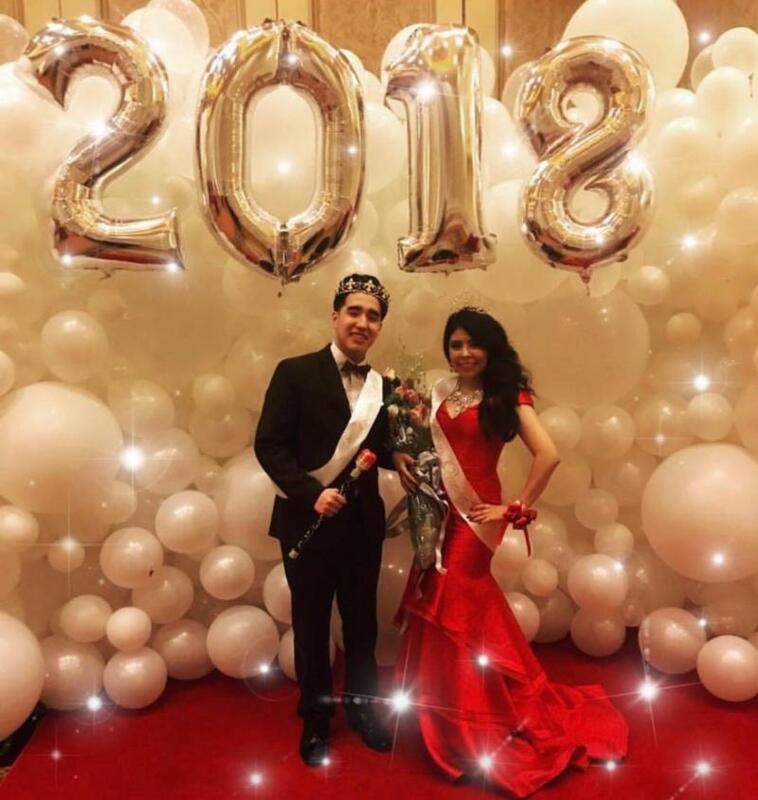 "This is not just a Dream Prom, the experience that Venetian/Sands executives provide includes mentoring and guidance as students plan their prom. The Venetian also hosts tours/visits of the Venetian so that students can learn about Career Pathways related to Hospitality. Competing schools were assessed on improvements in grade point average and attendance as well as their demonstration of JAG employment skills during a visit from judges to competing schools. And the winners are: Western, Canyon Springs and Durango High Schools! 3. 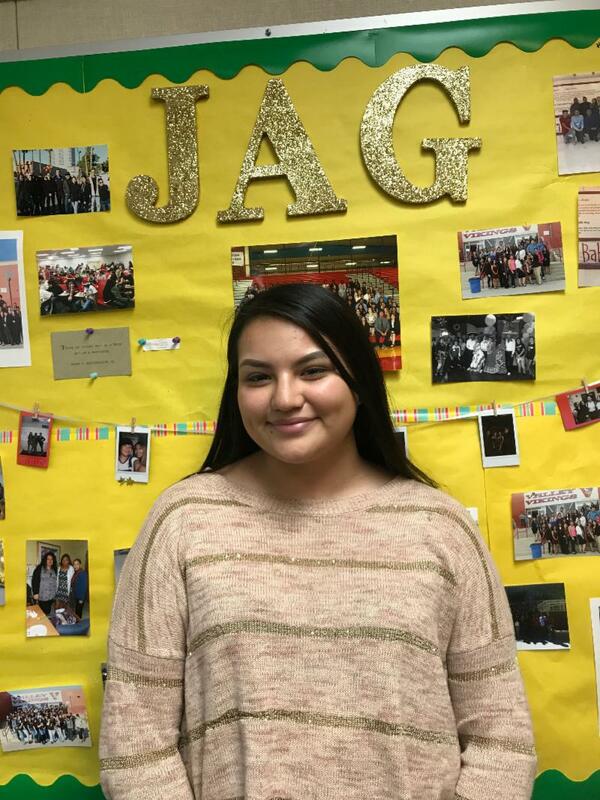 Meet Ivette from Valley High School, A JAG Success Story in the Making! Sophomore year Ivette really could have used the JAG class because she was always ditching, she was hanging with the wrong crowd, and overall did not care about school. If she would have been in JAG sooner, her chances of graduating with honors would have been a lot higher because JAG would have helped her be more focused and driven with her goals and priorities. This year, Ivette was able to make up for what she messed up previously: her grades have improved significantly, she is more communicative and social with her peers and underclassman, has learned how to behave as a professional, she has earned her first job working with the Las Vegas (FC) Lights , she knows how to handle a job interview to be successful, and feels confident moving into the future after graduating high school. She has been accepted into the college she yearned the most, Nevada State College, and will be attending there this Fall Semester 2019, majoring in Psychology! Through JAG, Ivette’s mindset has changed to be more positive and finding a purpose in her life. Thank you JAG! 4. JAG's First Regional Career Development Conference a Hit! 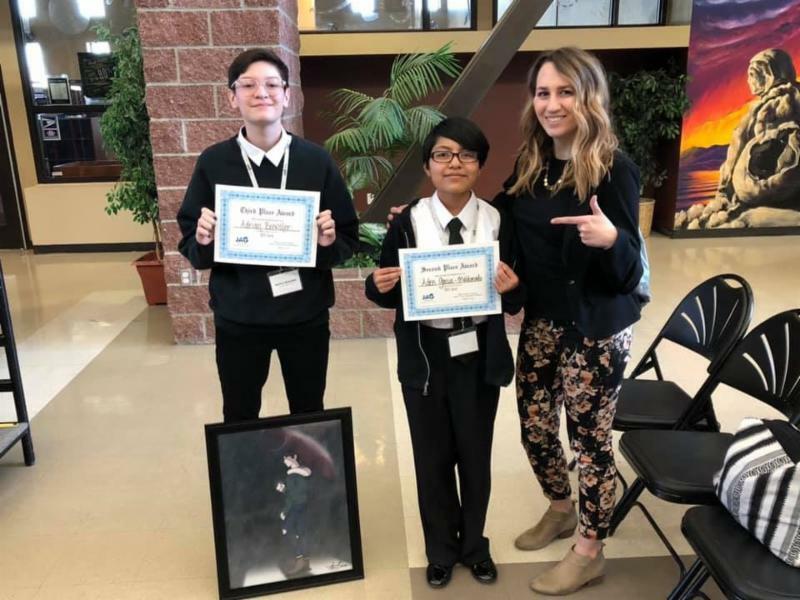 Art Competition winners Adrian Brewster and Aden Garcia-Maldonado are pictured with Wooster JAG Specialist Melanie Whitfield at the Regional CDC in Reno, Nevada. JAG Nevada’s first annual Regional Career Development Conference was held recently at Truckee Meadows Community College! Students competed in essay writing, interviewing skills, art/performance, decision-making, public speaking, and attended self-development workshops. Good job to all the students who were selected to compete and congratulations to Adrian Brewster and Aden Garcia-Maldonado on winning 2nd and 3rd place in their art competitions. Mission : Jobs for Nevada’s Graduates Inc. strives to graduate every student entrusted in our care from high school and set them on a path to higher education, a career or both. Vision : Graduate every student, career and job ready. With a 94% graduation rate and 35 years of proven success in schools nationwide, the JAG model is highly effective in preparing Nevada’s future workforce with the workplace skills students need and employers seek. The JAG model combines elective credit, employment readiness, student-led career associations, supportive services and, most importantly, a caring adult who spends over 120 hours with each and every JAG student. JAG students attend JAG classes every day like they do their other classes, and build close relationships with each other and with their JAG Specialist. These relationships cannot be built after school or on weekends; these relationships are built one-on-one, day in and day out, as students come to trust their Specialist as a caring adult and mentor who is present in their life. JAG begins in the sophomore year and follows until one year after graduation from high school, ensuring that students not only graduate, but also have found a career pathway into a better future. JAG Nevada partners with public education and private businesses to develop high school students via education and skills training into the talent employers want to hire, thus ensuring better lives for students and their families, and creating a brighter future for Nevada. 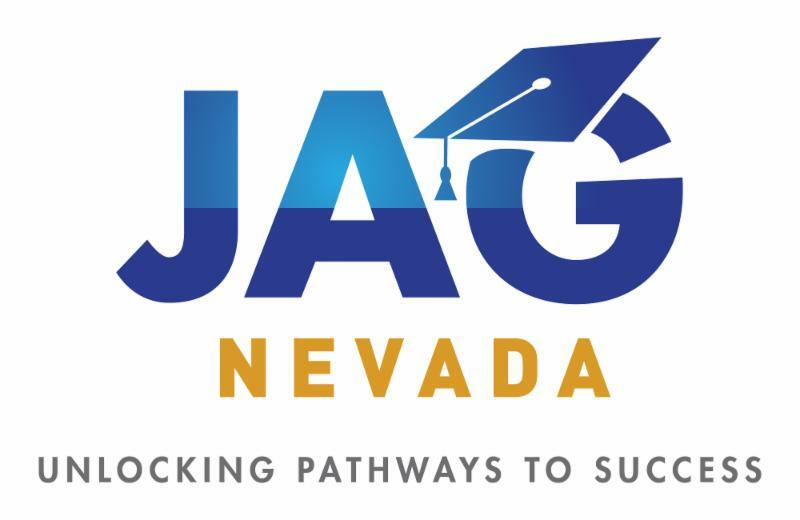 JAG Nevada was launched by Nevada Governor Brian Sandoval in bipartisan partnership with the Nevada State Legislature to help increase Nevada’s high school graduation rates and youth employment.